Firstly, congratulations to Jayne Joy who was joint 6th in the British Athletics Mountain Running Challenge for 2014 which included her Inter-county achievement and a race in her England vest. Full results below. Pilgrims Cross on Wednesday 13th August was honoured with two Helsby vests at this Rossendale organised 6 miler with over 1000ft of ascent. Phillip Roberts showing his good form was first Helsby home followed by the irrepressible Jim Jones, both under the hour. 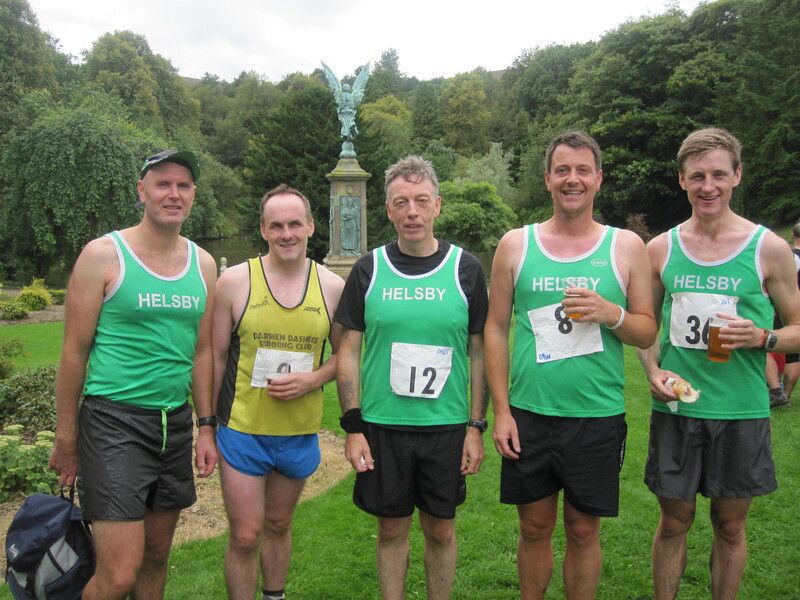 Delamere Park Run 5k on Saturday 16th saw an amazing four new PB’s from Helsby runners, Colin, Max, Dave and Louise! Colin Bishop was a solid 1st overall with new Helsby runner Max Wainwright 3rd overall, fantastic to see two Helsby members in the top three. Great running from Vanessa saw her 34th overall to claim 2nd lady and first in for Helsby. Well done to all who ran. 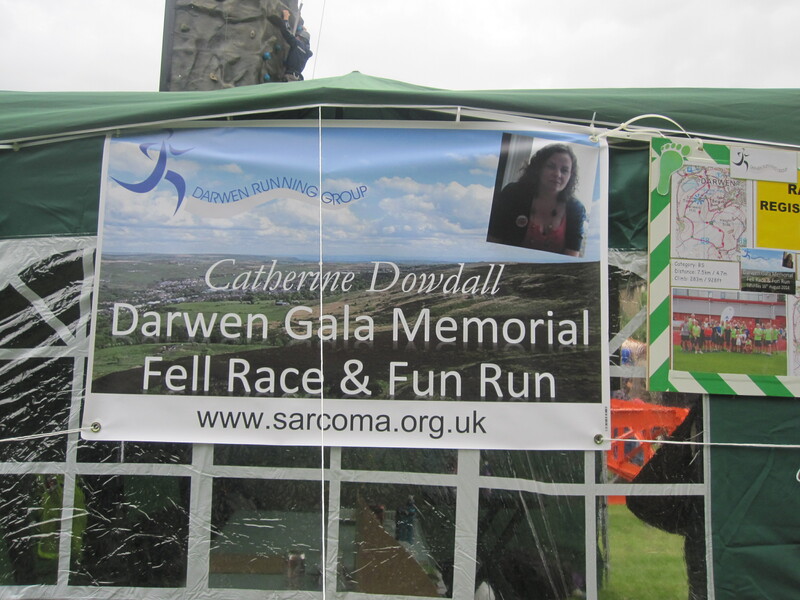 Saturday afternoon was the Catherine Dowdall Darwen Gala Memorial Race in honour of Jamie’s wife Catherine and it was a brilliantly organised event raising money for charity as well as a reflective afternoon. Jim O’Hara was having the race of his life although we are still unsure why he and six others decided to head to Bolton after visiting Darwen Tower but it did give other people in a green vest the opportunity of a scalp. Mario won his usual best in class category and Joe was out on the tower in fine voice along with Phil Gillard and Helen offering fantastic support as ever. Prize giving had Jamie on stage sounding more composed and professional than the Radio DJ’s hosting the Gala. “The race finally got started in the gala field after a slight delay due to the fete being late arriving which helped a few late runners who also got stuck behind the procession. The race starts with a quick climb through the park woods then up to Darwen Tower. Once you got to the top it was perfect conditions for a quick glance around to see some popular faces of Phil and Helen Gillard and of course ‘Mr Helsby’ Joe cheering everybody on. After a quick run down then round and back up to the moors we followed the path along to a single track which took us straight across ready for the run down back through the heather to the finish in the park. A highlight for me was seeing Phil Gillard pop up out of the heather like a meerkat taking photos and shouting where is Jim O’Hara. Once we all arrived back in the park and a chance to ask Jim what went wrong it was time to sample the free pint and hot dog which certainly put a smile back on Jim’s face. After all the runners watched the ferret and falcon display it was time for the presentations which Jamie compered in his usual good form. I would like to thank everyone who showed an interest in the race but unfortunately couldn’t make it due to other commitments. Maybe next year we can put it on the fell counter so Jim O’Hara can have another crack at it. 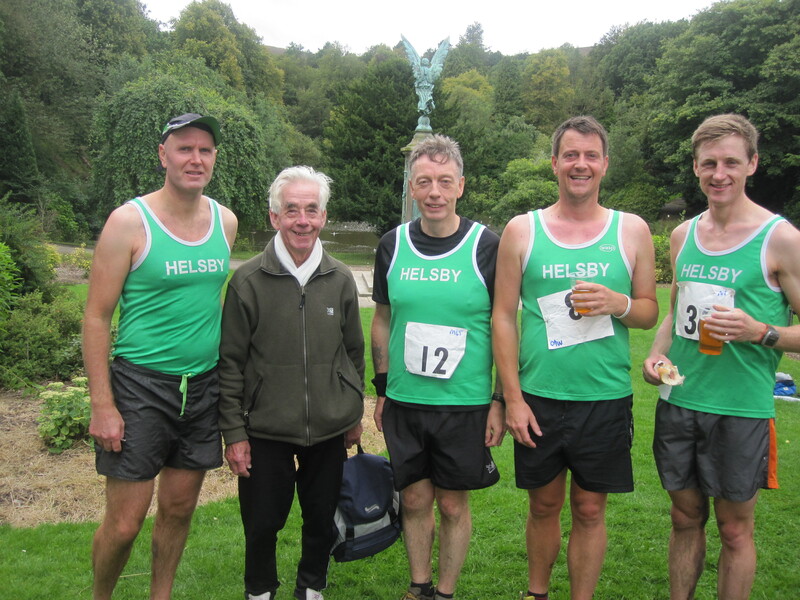 Sunday 17th was the Birchwood 10k with a near sub-40 run from Ivan seeing him first in for Helsby. Sunday also saw the Two Hillforts Fell Race which starts and finishes in Llandyrnog, North Wales. This was a testing course and as the race organiser stated in his email report ‘In bright and breezy conditions, a field of 46 runners took to the starting field beside the pub and sped off towards the heather-clad hills. Soon the fields gave way to the start of the long climb up to Penycloddiau’. Jayne Joy looked in complete control as she tackled this first Marilyn of the Clwydian Range and went on to secure 1st lady and 5th overall in a time that took 3 minutes off the previous record. Definitely worth considering this race next year for those that like running in the Clwydians. A good club counter I’d say. The Swiss Iron Trail race report by Chris Baynham-Hughes. “Coincidence can be a kind master. Whilst planning our summer holidays I was just about to book the ferry when an email arrived from the Swiss iron trail. The dates looked familiar so I entered into negotiations with the boss and a race on the way home was approved. Result. I’d been looking at this race previously as the T201 a whopping 201km and 11,500m of ascent had my mind boggling. A potential target for the future, but not one just before a 3 day return drive to Blighty. So I entered the T41 a curious title for a 43km race with just over 2600m of up and just a little less in descent. We got going with a time trial around the lakes of Lenzerheide (4km on the flat) before heading up the surrounding mountains on our way to Davos. Sitting neatly in 11th as we hit the climb the going got tough. I caught the guy in front half way up the mountain (he was from the Netherlands) and chatted the rest of the way before leaving him right at the top. The trails were very runnable and in most case were wide fire roads to allow access to the cable cars of this skiing and mountain biking playground. I spent the rest of the race cat and mouse with an Austrian chap over 9th place – he was very serious about the whole thing; over taking me whilst I took selfies and enjoyed the intermittent view between the clag. A relatively small error over a turning sent me down the mountain but it was reasonably quickly recovered. Unfortunately the beauty of the course was only revealed to us on an infrequent basis and the weather took a turn for the worst, even snowing at points. I hit the bottom of the final climb roughly 2.5 minutes behind the Austrian who had put on a bit of a lead due to me tripping over a little earlier and deciding I needed to take on some sugar and not do myself an injury before the Ring O’Fire in two weeks time – he also gained by not stopping at the check point to resupply, but I was confident I could make up the time he’d gain on the climb through channelling my inner Mario on the downhill – where I had originally managed to pass him. I arrived into Davos to excited screams from the boys. Realising I wasn’t going to catch the elusive Austrian I ran carrying the boys in for the final section. Thankfully Laura pointed out we were a little further away than I had thought so James went on my shoulders and Rhys ran in hand in hand with me in 5 hours, 46 minutes – my slowest marathon to date I think J. Certainly a fab end to the holiday. Let me know if I’ve missed any events or challenges achieved this week as I can always keep the blog up to date. Enjoy the remaining bits of the summer and good luck to all those marshalling, running or enjoying the festivities at the Robbie Wobbler on Wednesday night. 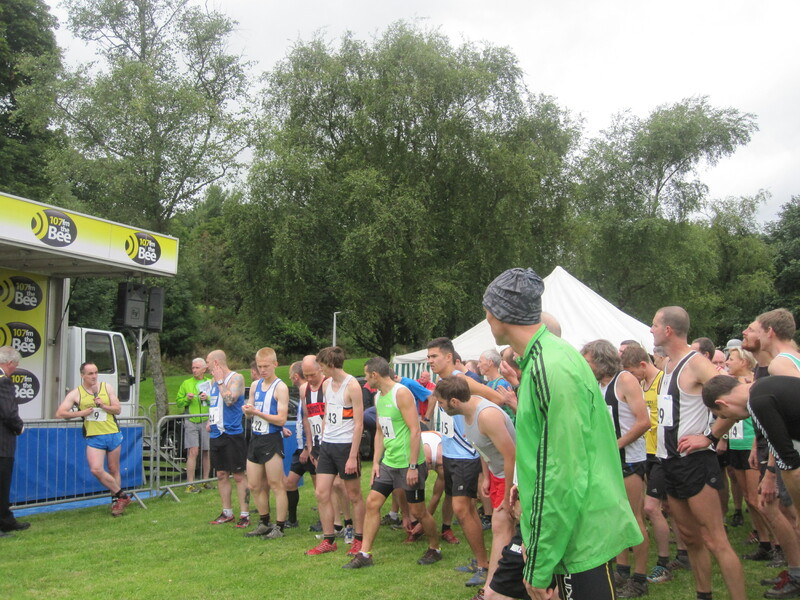 This entry was posted in Fell Running, Road Running, Trail Running and tagged Darwen Gala Memorial Fell Race, Delamere Park Run, Pilgrim's Cross Fell Race, Two Forts Fell Race, Warrington Park Run. Bookmark the permalink.